Mutations in BRCA 1 and BRCA 2 are associated with increased risk of various reproductive and estrogen-fed cancers. 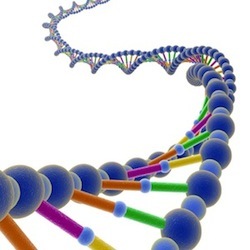 Researchers from the Department of Obstetrics at UC San Francisco recently published a study testing a possible connection between BRCA 1 and BRCA 2 mutations and early onset menopause. Researchers identified 382 patients carrying a mutated BRCA 1 or BRCA 2 gene. All patients were part of the Breast Cancer Risk Registry Program at the college. The active participants were compared with women who did not possess the mutated genes. The control group consisted of 765 women. After all relevant risk factors, including smoking and use of oral contraception, were taken into consideration, women in the active group entered natural menopause an average of three years before women in the control group. Researchers concluded that BRCA 1 and BRCA 2 mutations were directly associated with early onset menopause. Heavy smoking decreased the age at time of natural menopause in the active group. Source: Lin WT, Beattie M, Chen LM, Oktay K, Crawford SL, Gold EB, Cedars M, Rosen M. Comparison of age at natural menopause in BRCA1/2 mutation carriers with a non-clinic-based sample of women in northern California. Cancer. 2013 May 1;119(9):1652-9. doi: 10.1002/cncr.27952. Epub 2013 Jan 29.